These Sockets are designed to be used with our pre-cut All-Threads and are designed for customers who are going to need different lenghts of adjustment for different situations. Basically the Sockets are Tapped with an M10 or M12 Female Thread and you just screw your All-Thread/Studding into the Socket to form the Adjuster. As well as the benefits of being able to control your own level of adjustment, customers have used this assembly in the past, when they need to weld or fasten the end of the thread once it's passed through another object. The Base of the Socket is Oval in Profile and comes supplied with fixing holes at either end and the outer body of the Sockets are a Hexagon shape, so that they can be adjusted easily. 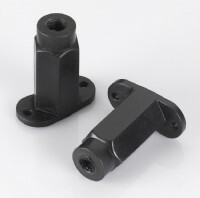 Originally these feet were manufactured for Baths and Shower Trays but there's a huge variety of applications they can be applied to, mainly thanks to the unlimited range of thread forms available. If you can't see the size of All-Thread you're after in our listings then let us know as we can produce specials to order, or you might want to consider our Utility Adjuster range which are already pre-assembled.